It’s been a memorable season, though mostly for the wrong reasons. Last night, the Canucks handed out their awards; today, it’s our turn to handpick some of the best of the best and the worst of the worst of the 2013/2014 Canucks season. It’s no coincidence that the Canucks’ woes started at around the same time that Mike Santorelli went down thanks to Martin Hanzal of the Phoenix Coyotes. Up until that point, Santorelli was enjoying a career year with 28 points in 49 games, including a wonderful stretch of 12 points in 11 games in late November and early December. He played mostly at centre (with a bit of time on the wing) and gave the team some depth and a different look. It will be interesting to see if Trevor Linden is able to lock up him to a new contract. Brad Richardson has quietly put together a strong year and his 23 points in his second-best career total. He is a reliable penalty killer and strong in his own end, as he is one of the few Canucks with a positive +/- rating. He is the anchor of the Canucks’ third line that has been a pleasant surprise and best line for the team at times. In a season where just about everything went wrong, Chris Tanev was one of the few bright spots from the blueline. Tanev retained his defensive stalwart status and rarely looked out of place, and even made some strides offensively by potting six goals and adding eleven assists, which by Tanev standards is quite pleasant. Stanton, who gets our honorable mention, proved to be a stabilizing force as a third pairing blueliner. Not bad for a waiver wire pickup. In just his second full NHL season, Kassian posted 14 goals, 15 assists and 29 points, all but 1 goal on even-strength, and mostly while playing in the bottom-six. Kass’ development – his physical play, presence and control improved immensely as the season went on – should be encouraging for the Canucks, who have been clamoring for a big and skilled winger for a long time. At one point this season, Lack was among the league’s best in GAA, save percentage and shutouts. His numbers dipped in the last couple of months as Torts started him in 19 consecutive games after the Olympic Break, but still, it’s been a season to build on for the rookie goaltender, who, barring the Canucks acquiring another big-name goaltender in the summer, will be the team’s starter moving forward. For everything that could be said about the lack of production from the Sedin twins, Alex Burrows was supposed to be the constant. Troublesome and untimely injuries limited him to just five goals in 49 games, but valid excuses aside, this is a player who was a mortal lock for 25+ goals annually. Are those days gone? Expectations were tempered from the start so it’s hard to say he was disappointing when you’re not expecting a whole lot. Despite being out since late January, Mike Santorelli was the Canucks best player in this bad, bad season. 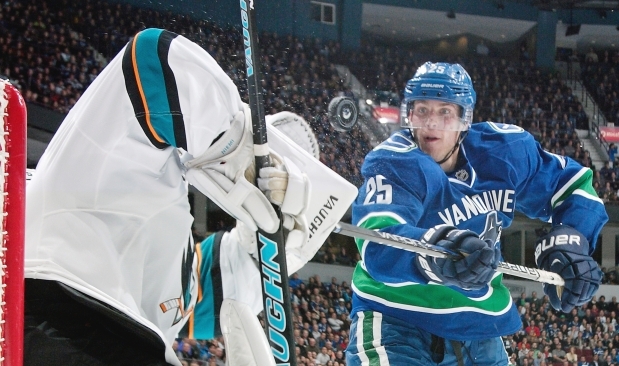 When healthy, Santorelli was a very consistent player – played well, scored goals, and assisted on many goals. In fact, despite missing the final 33 games of the season, Santorelli still sits in 6th place on the Canucks points leaderboard with 28 points (10 goals, 18 assists). The Canucks sure lacked a lot this season, but for the most part, they didn’t lack goaltending. After Roberto Luongo was traded to the Florida Panthers, Eddie Lack was left with the number one job, and he certainly did not disappoint. Since February 26th, Lack played 19 consecutive games, and had an 8-9-2 record with 2 shutouts in that period. While the Canucks’ top-six were dropping like flies mid-season, Canucks fans repeatedly asked for Jensen to be called up from the Utica Comets. After getting passed over by 4th line guys like Darren Archibald and Kellan Lain initially, Jensen finally got his opportunity on March 8th, and he proceeded to post 5 points (3 goals and 2 assists) in his first 7 games. In Lain’s first game in the bigs, he logged a grand total of 2 seconds, yet ended up with a fight and 15 minutes in penalties. In his second game, he scored a goal on his second shift. It’s about as memorable a start to an NHL career as anyone’s. David Booth may have seemed like a shoo-in for this one. After all he does seem like the most likely candidate for being bought out this summer, but I find the argument that Edler is actually the better long-term buy-out choice pretty convincing, and even if he’s not, new President Trevor Linden has already revealed that he’s not against asking a player to waive a no-trade clause, so we could see Edler submitting a destination list this summer. So why exactly won’t we be missing him? Well since signing his new six-year extension in early 2013, he hasn’t exactly done much to convince anyone he’s earned it. Edler also finished the season with a league-worst (!) minus-39 rating. Now you may say plus/minus doesn’t mean much of anything, and I agree it’s not the most insightful stat, but that is still an awful lot of time to be on the ice when goals are being scored against your team. It’s really only a symptom of a larger issue. Edler hasn’t been making smart plays, he’s often found out of position, production is down, and overall he’s been ineffective at his role, so congratulations Alex Edler, you’ve won our 2013-14 Martin Rucinsky We Probably Won’t Miss You When You’re Gone Award. John Tortorella takes home the Cody Hodgson Award for Best Drama. His performance behind the bench – i.e. how he lead practically every Canuck to have career-worst seasons – contributed to this, but his breakout performance was his storming of the Calgary Flames’ locker room during the first intermission of their home game on January 18th. Tortorella’s confrontation was captured live during Hockey Night In Canada and led to a 15-day suspension, without pay and no contact with his team. I’m sure in Torts’ acceptance speech a big thanks will go out to Bob Hartley for his supporting role. Coming in a close second is the Heritage Classic goaltending controversy. Seemingly out of nowhere, a goaltending controversy was created – Eddie Lack was given the starting position for the Heritage Classic, a decision that didn’t sit well with the fans, who thought Roberto Luongo had earned that starter spot, and deserved to be starting this historical game; their issue was not with Lack, but with the organization. The drama came to a head as fans made their displeasure known during the starting line-up announcement, “Eddie Lack” was announced to resounded “Boos” and “We Want Lu!” chants. Everything about this event gets the award: the Flames starting the 4th line; Bieksa taking the face-off; Kellan Lain getting 2 seconds of play in his first NHL game before getting a game misconduct, while his parents flew all the way from Ontario to see him play; Sestito’s comment after the game and, of course, John Tortorella’s infamous reaction, including him storming to the Calgary dressing room. This moment will go down as one of the most infamous moments in Canucks history. One more Islanders goal, and they'll equal what the Broncos put up in The Super Bowl. The Canucks were up 3-0 going into the third period and ended up losing 7-4. The Islanders scored SEVEN GOALS in one period of hockey — something that would truly only happen to the Canucks, and this season especially. Many people, like myself, had traded the game during the second intermission (the Canucks were winning, after all) to go to other things, so the post-game reactions were what really made this event truly comical. Never forget. Clearly the Roberto Luongo Award for the best tweet of the season has to go to the man that took us all on a wild social media joyride for several seasons: Roberto Luongo. Lu was once again on top of his Twitter game this year, proving to us all that he’s one of the funniest (and weirdest) people in sports. He even sent us a few pleasantries from that wacky Florida place where he plays now. If you’re a Canucks fan, I don’t think I have to explain to you why this picture just rules. I don’t think I’ve ever seen Ryan Kesler this happy before. My SOB Award goes to Tom Sestito. Because he managed to get head scratchingly ridiculous penalties this year. 27 minutes of penalties in 1 second of ice time. And let’s not forget (how could we forget?) the unheard of 7 minute penalty he earned in our ‘moral victory’. Also he got a game misconduct in the final minutes of the last game of the season for reasons I still can’t figure out. Aside from Sestito, a lot of these are exactly the type of stupid, knee-jerk reactions you’d expect from Canucks fans.